At the Disneyland® Hotel, you will find everything from award-winning fine dining to fun-filled Disney Character meals. But perhaps the most magical feature is the touch of Disney magic sprinkled throughout its 975 rooms. A stay here is a uniquely Disney experience you won’t find anywhere else! Stepping through a pair of breathtaking stained glass doors, you find yourself in a spectacular lobby anchored by a warm and welcoming stone hearth. Reminiscent of a mountain lodge, yet on a much grander scale, Disney’s Grand Californian Hotel® & Spa draws upon the rich woods and other natural elements featured in turn-of-the-century Craftsman architecture. Entering the lobby of Disney’s Paradise Pier® Hotel is like going back in time to the heyday of California beachfront boardwalks—only with a whimsical Disney twist! 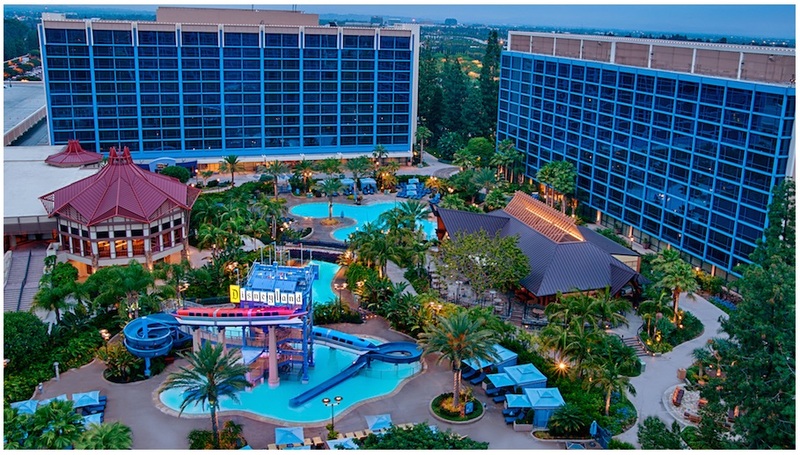 From the “surfin’ Goofy” statue in the lobby to the roller coaster-inspired water slide at the rooftop pool, everything about this hotel tells you that you’re in for a totally unique, totally Disney experience. Disney Resort Guests will be allowed 30 minutes early entry than the published listed time through the gateat Disney's Grand California Hotel® & Spa. This will allow hotel guests to get in line for Disney's FASTPASS tickets to each evening's performances of World of Color. Don't worry about carrying packages around all day. Instead, enjoy the convenience of having purchases from select Disney shops delivered right to your Disney Resort.